Weaving Ideas via Idea Sessions and LuMpY Mail are Paulette’s favorite tools to assist clients in selecting the perfect promotional products for their specific needs. Idea Weaver Promotions offers thousands of products and loves to play "Stump the Idea Weaver" which is when clients call for an unusual product. 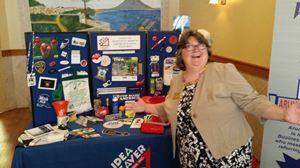 Paulette fell in love with the promotional products business when she took a part time office job for a Maryland-based, military-contracting corporation who sold Maryland Souvenirs, American Pride Items and Recognition products to branches of the Military. Paulette literally wore every hat in the company before hanging out her own shingle. From help desk and data entry, to marketing and management... the next logical step was to start her own business. Idea Weaver Promotions, Inc serves the needs of anyone and everyone who has a need for imprinted products to promote their business, organization or event. We would love to learn more about you and more specifically, HOW WE CAN SERVE YOU! Make us your first call when planning your next event or promotion. We promise to work hard for you and if we can’t help you with your project, we will refer you to a local trusted professional who can. Please Mention "PBA Shop Local" when placing order. Only 1 Discount may be applied per order.